English Movie Reservoir Dogs (1992) . 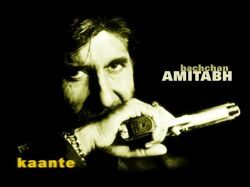 Kaante director Sanjay Gupta was involved in a long court case about this movie due to its being a copy of Reservoir Dogs. Six total strangers teamed up for a bank robbery. But something went wrong. One of the men is the rat, an undercover cops. But who?